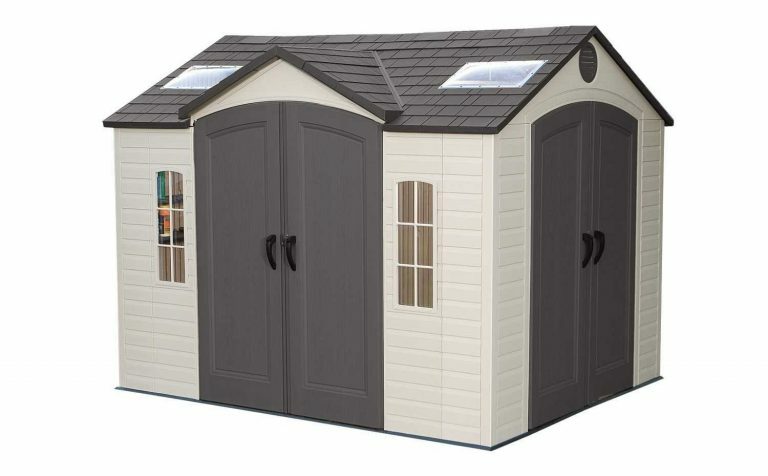 Lifetime sheds offer modern looks and style for your storage needs. 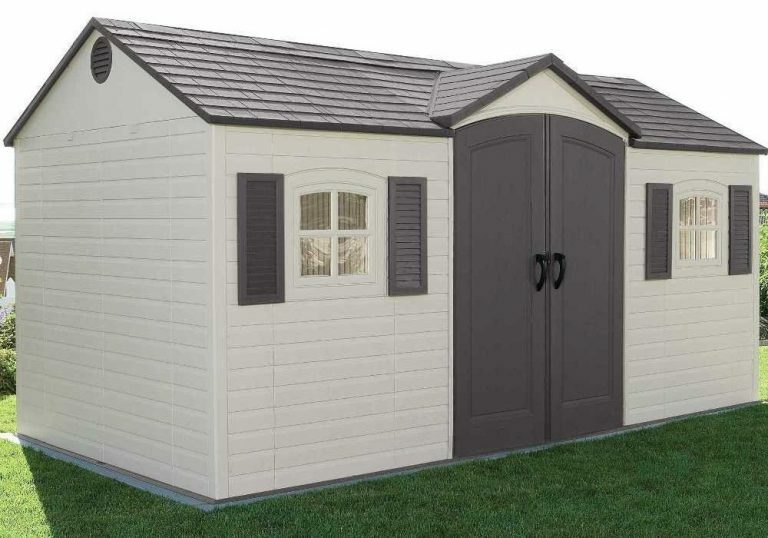 Whether you require a large shed to accommodate a vast amount of storage or an attractive shed for your patio accessories, Lifetime’s range of top rated storage sheds will cater for you. 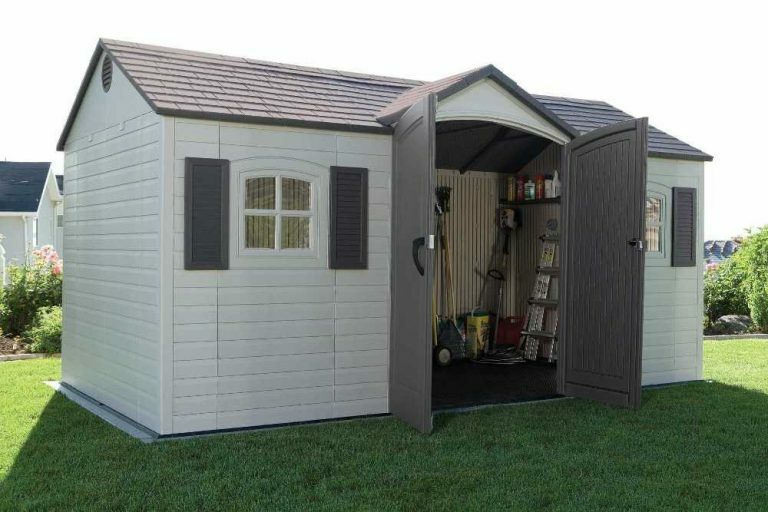 These highly acclaimed sheds are designed to withstand the weather elements from scorching sun to driving rain whilst protecting storage, keeping it safe and dry. 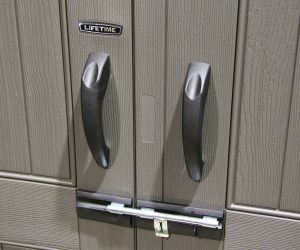 Established in the USA, Lifetime is well renowned for their innovation and quality design, with storage solutions in various sizes and styles to suit different circumstances. 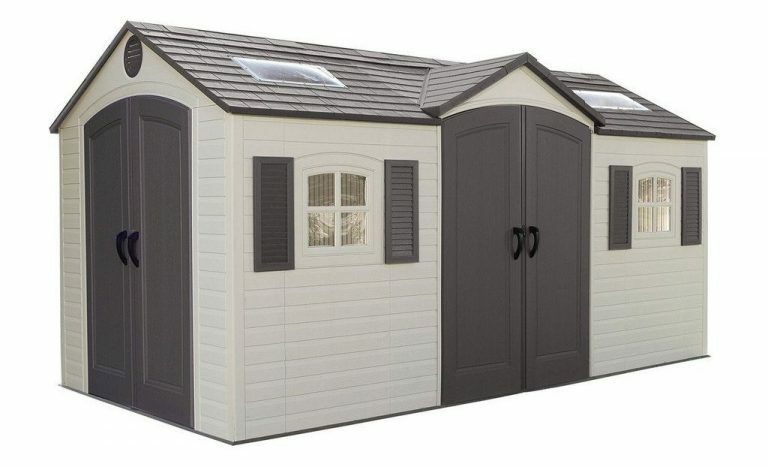 Lifetime offers a modern, clean looking range of stylish sheds with embellishing features, all following the same distinctive looks regardless of size. 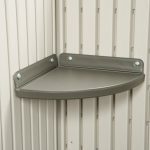 Appealing off-white walls with a grey or brown colour for the trim, roof, doors and vents, resulting in desirable looking storage solutions that will charm any garden, patio or backyard. The shed’s composition is a plastic/resin make-up. The resin is manufactured from high density polyethylene resin which is UV protected, to prevent fading and cracking in the sun, weather-resistant to prevent rain penetrating the surface and durable, providing a structure to withstand the weather elements. For those who built their shed for a few years ago remark on how this non-fading and non-cracking design works – thumbs up here! The shed walls are reinforced within a steel structure, powder-coated to prevent rusting, ensuring a robust shed capable of enduring whatever the weather throws at it. 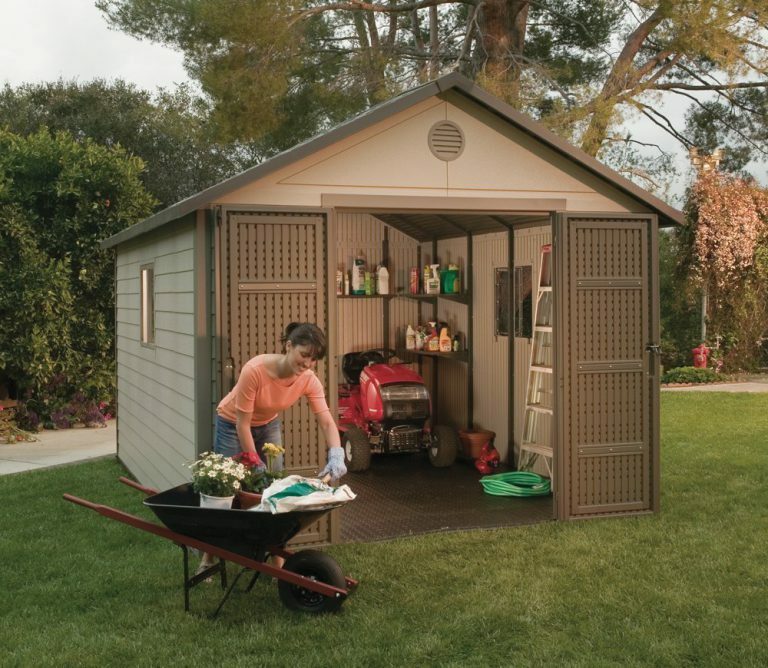 A lightweight composition that assembles into a super strong and durable shed. This environmentally friendly resin produces a shed that will not rust, rot, peel or decay; will never require painting or staining as it’s virtually maintenance-free. 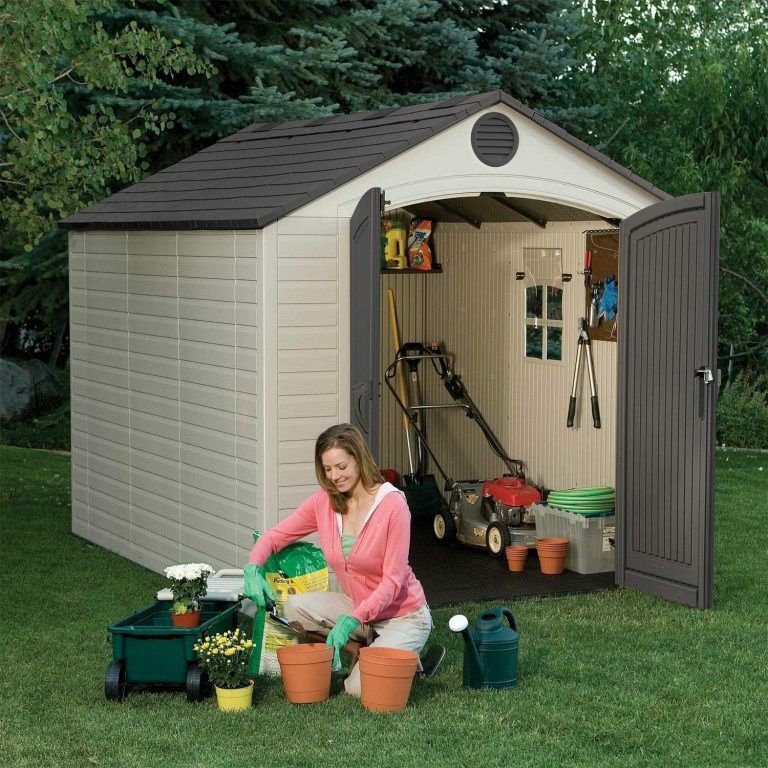 A hassle-free shed without the upkeep duties wood sheds have. A wash or hose down when dirty is all the maintenance these sheds require. It is imperative that Lifetime sheds, like all other plastic sheds are built on a solid level surface. This provides integrity for the overall construction and usage of the shed. Wood decking is ideal, a very popular option, easy to level and easy to secure the floor to the base. A great tip from one guy was to build the shed on raised decking slightly above ground level so the shed will not be subject to flooding, then drill a few holes in the decking to allow for water drainage rather than allowing water to stagnate under the shed floor. Alternatively, paving slabs and concrete are an ideal solution too as long as it’s level. 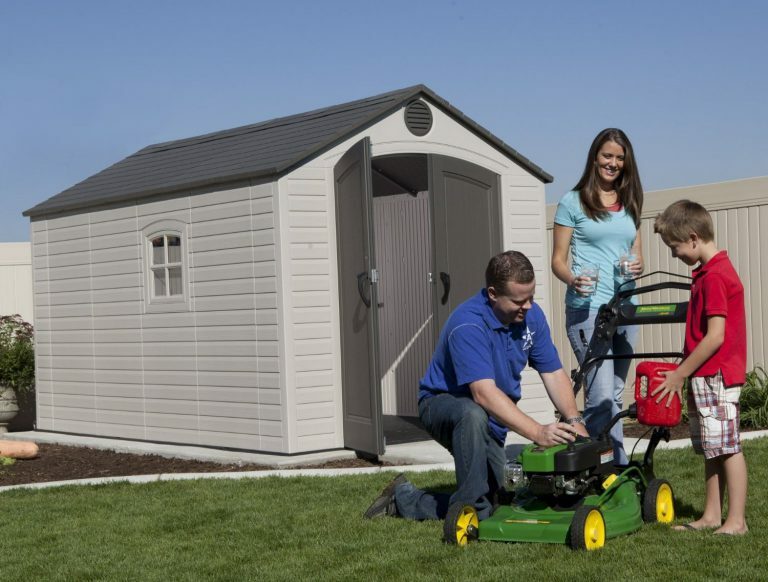 Sheds are assembled with two people using household tools, following step by step instructions. Starting off with the shed base, then walls and finally the roof and doors. Top tip – Get all parts out and organised before assembly, the build goes a lot easier. The use of a drill driver set on a low torque setting provides a huge advantage too. 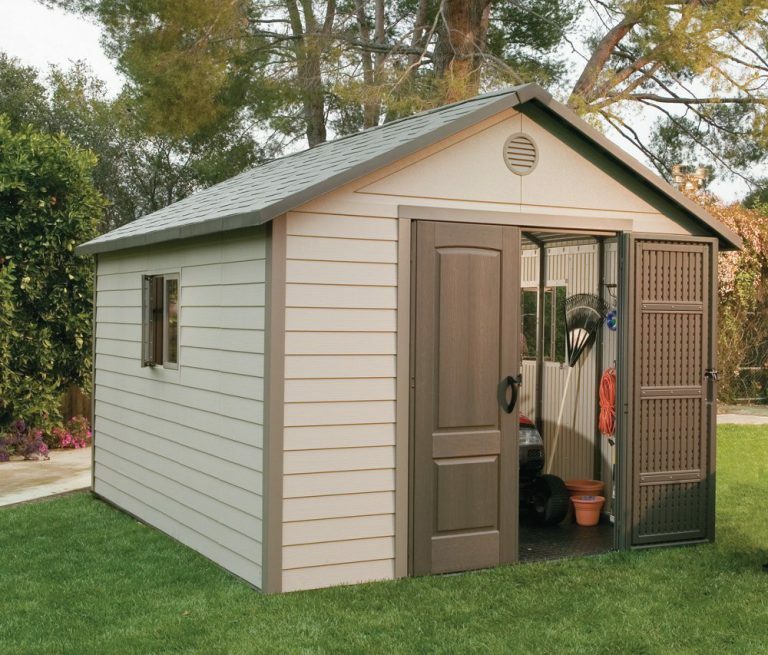 Here’s a video on how to assemble a Lifetime shed – a great instructional tutorial. It’s always advisable to anchor the shed floor down into the shed base using the appropriate screws dependant on your base material, for security against high winds. Use good sized washers with the screws too, to provide more strength to the anchoring. These sheds are fairly light and will be pushed around by the wind if empty. 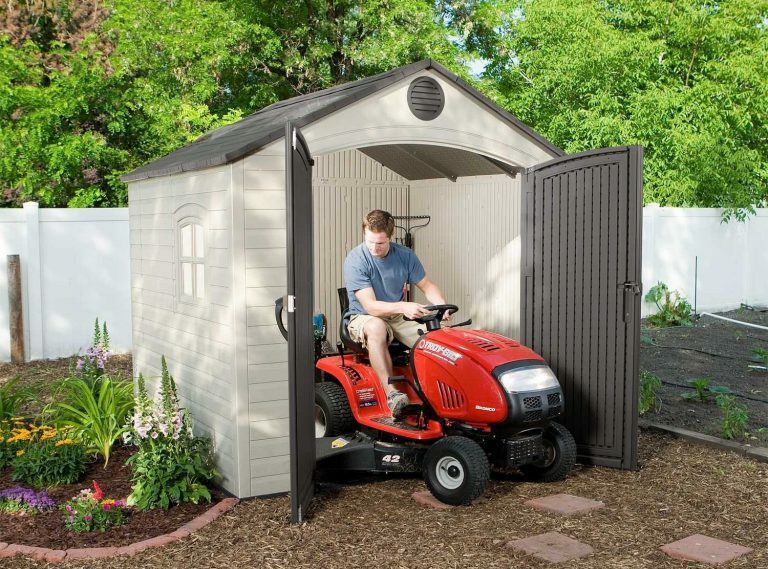 Once built and anchored down correctly you will have a long lasting, hard wearing shed. 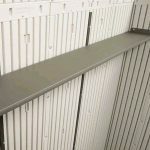 The floor serves as a heavy duty floor allowing you to store weighty a sizeable storage items, the doors are able to line-up correctly, the whole construction assembles straight forward. For those few who have had difficulty assembling, one has to question whether their shed was built on a solid level surface. 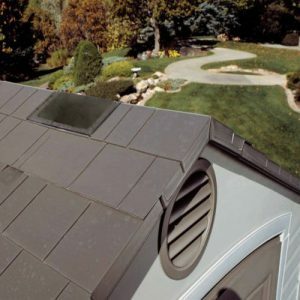 The roofs have a real-life tile affect, an attractive appearance with the durability of resin. All roofs are designed with a high pitch to enable rain to run off immediately. The roof stretches beyond the shed walls resulting in quick drainage whilst preventing water entering the shed via the top of the walls. A small minority who have built these sheds in heavily snowy climates do question how much snow these sheds can hold. It maybe an idea to contact Lifetime for their advice before purchase, depends on how much snow your area generally receives. 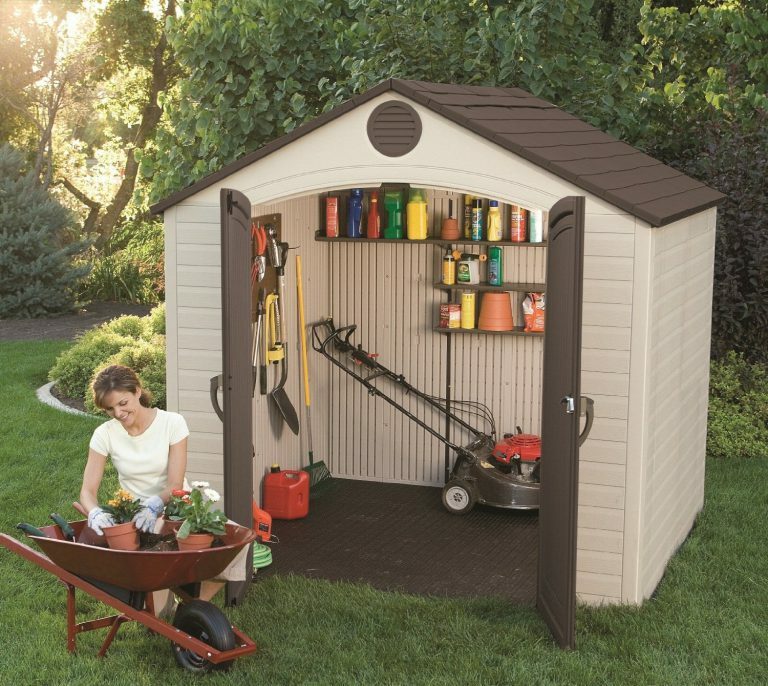 All lifetime sheds include a built-in heavy duty floor that’s secured to the walls to provide a seamless waterproof shed. Some have remarked, although the floor to walls are designed to be seamless, they have encountered a bit of water coming through after storms but have rectified this by applying caulk where the walls and floor join. 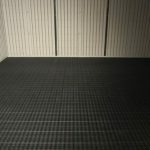 The floor joins together with thick, quite flexible corrugated resin sheets designed to clip into each other to make up the floor. It’s important that the shed’s base is built on a solid level base providing integrity for the overall floor’s construction and usage, making it capable to withstand the stresses of demanding use. 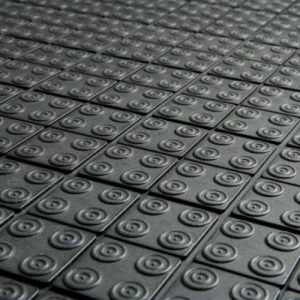 The floor is made from high density polyethylene resin that is designed to be weather-resistant, anti-slip and manufactured for protection against oil, stains and solvent spillages. Inside these sheds you don’t get a claustrophobia feeling of being hemmed in as they provide plenty of headroom. Steel A-frame trusses support the high peaked roof providing strength whilst skylights allow natural light to enter the shed. The high pitched Apex style roof is a well designed feature of Lifetime sheds serving two main purposes, a superb rain water drainage outside the shed due to their steep angle whilst inside the shed they provide excellent headroom. 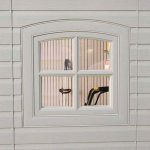 The windows, manufactured out of shatterproof poly-carbonate material are an important feature especially on the larger sheds, while they do make the sheds look more attractive, they allow for natural light serving as a safe environment, giving the sheds a light and airy feeling so you can see what you are doing without rummaging around in the dark. The windows are fixed on some models and open on others. Air vents are another very important feature for a plastic shed. Without vents plastic sheds would sweat causing an unsafe environment and damaging storage. 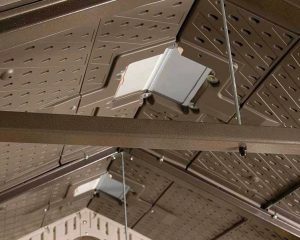 They are built-in above the doors or at the peak of the Apex allowing air to flow around the shed providing a safe environment preventing sweating, whilst being designed to prevent pests from entering. 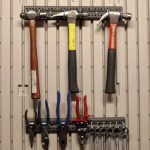 Peg strips for tools, shelves and corner shelves are also included and built-in to the walls on most models (check your size shed to see what is included) which is a good feature as installing your own shelving is not usually an option with plastic walls. If you require more shelving, especially heavy duty, consider stand alone shelving, it’s much more practical and will serve you well. 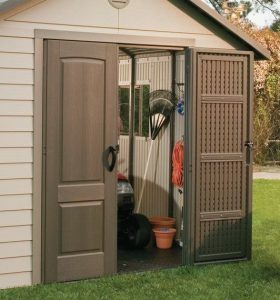 Wide robust double doors with user-friendly handles allow for great access into these sheds providing an easy entry/exit system for storage. The doors are fitted with a button catch, an opening mechanism unique to Lifetime sheds. Each door is fitted with internal bolts to keep the door closed giving you the option of using either or both doors for entry into the shed. The doors are built with a sturdy steel reinforced frame. Another reason it’s vital that these sheds are constructed on a solid level surface, to enable the doors to line up correctly. A few have had leaks of rain water through the doors after storms, although assembled and lined up correctly. 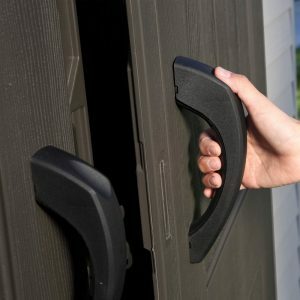 Lifetime recommend applying weatherstrip to the inside of the door, around the door hinge tube to prevent the water entering. Security-wise, the doors are lockable by using a padlock (padlock not included). Such a stylish looking shed with oceans of space, nice and airy – looks good enough to live in! Cleaning any plastic/resin shed is very straight forward and it’s the only maintenance job usually required. Most of the time a quick hose down or pressure wash set on a low setting will do the job. For more stubborn stains a mild detergent or washing solution mixed with warm water and wiped down usually does the trick. For those ingrained stains or for mildew and mould growth use 2 cups of white vinegar and two tablespoons of washing liquid mixed into a bucket of warm water usually provides great results bringing it back looking new again. Use a soft bristle brush or cloth to do this cleaning as an abrasive material such as wire wool will usually mark the surface of the resin. Sap is better washed off and removed as soon as you notice it. Sap chemically bonds to the surface of resin like it does with many other materials, if left it becomes more difficult to remove. 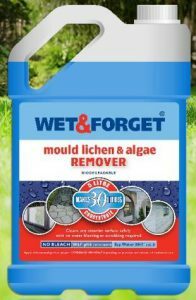 Wet & Forget is a superb cleaning solution for removing mould, mildew, lichen and algae etc. Many use this for cleaning patios, driveways and garden walls etc but it’s great for cleaning all plastic/resin outdoor seating, outdoor storage units and sheds etc too. Add 1 part Wet & Forget to 5 parts water into a garden sprayer and spray all over the shed, then leave it. It usually takes a week as the natural weather with the Wet & Forget work their magic to provide a clean, new looking shed. Wet & Forget receives outstanding customer feedback, simply because it works without much work. No rinsing off and scrubbing to do, it doesn’t contain bleach, it’s non-acidic and non-caustic – a gardeners dream. 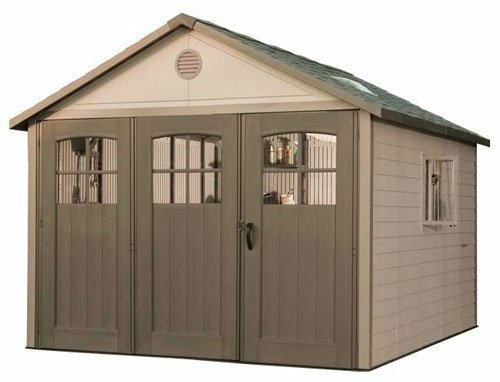 This large Lifetime shed is a newer style, slightly different colour scheme, different built-in floor and doors but matches the distinct look of Lifetime. A very spacious shed, designed with tri-fold doors allowing great access. Most people are very security conscious when it comes to storing their possessions outside of their home and rightly so. 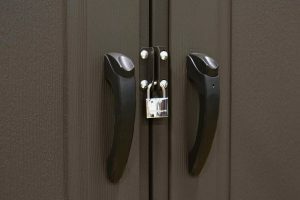 There’s not a lot of difference between resin, metal or wooden sheds regarding security as there are tools to cut all padlocks, so although a metal shed is maybe more secure – is it? 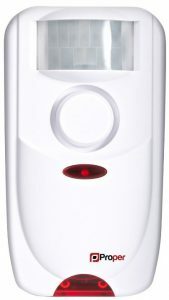 Battery operated alarms with a motion sensor are becoming a favourite security device for sheds today as not everyone wants to go to the trouble installing electrics in a shed. Many put a sign up to say an alarm is installed. There is usually one way to deter a thief and that’s a loud noise – works as a good deterrent. ‘Shop’ then ‘Shop Sheds’ in the top menu will lead you to the most popular battery operated alarms. 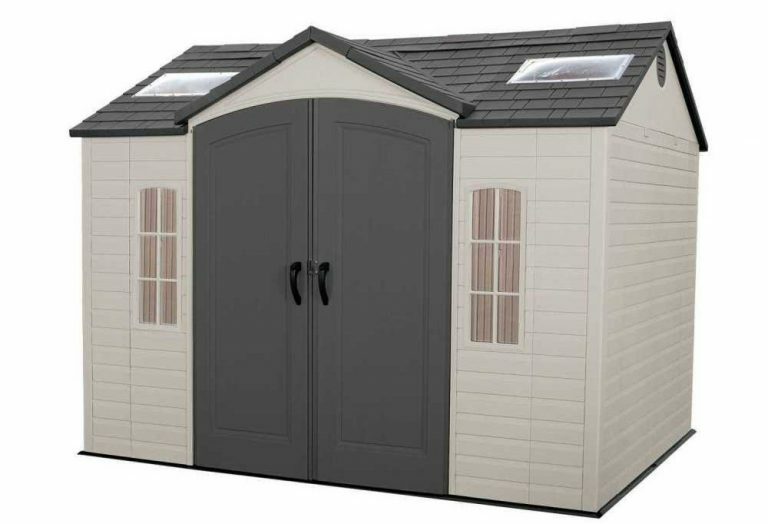 Lifetime caters for many different size sheds in various styles to suit most outdoor storage solutions. 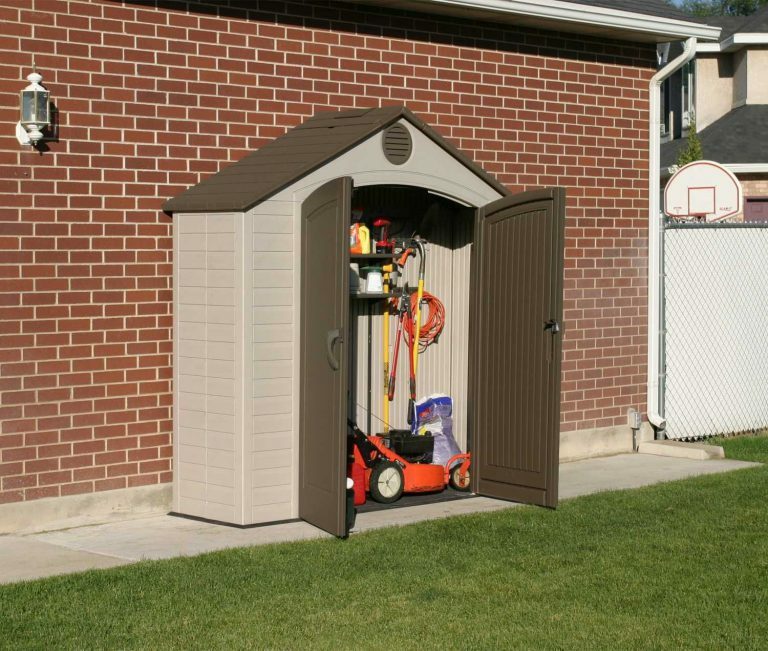 These are top rated storage sheds that frequently receive outstanding customer feedback to confirm this. If you live in an area that suffers heavy snowfall, check with Lifetime first regarding the strength of these sheds. 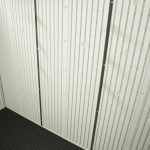 If the shed is going to suffer blazing hot sun and you’re worried whether doors may warp, choose a shaded area or position the shed doors to face away from the direct sun. Always assemble a shed on a solid level base, this is imperative. Wow these sheds looks so so heavy duty and strong. 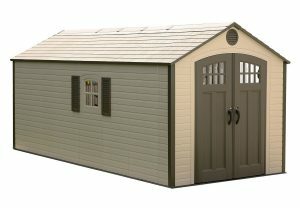 I need one shed for my garden and I will consider your reviews while buying one. You have written all the features in a really great way. Such a nice explanation, looking forward to read more reviews from you. Hey Sarah, thanks for taking the time to look around Lifetime’s collection of resin storage sheds. This twin lined composition of polyethylene delivers a more sturdy construction due to the fascia panels being ribbed on the inner layer and presentable on the exterior. Once they are secured to the steel infrastructure that constructs these sheds, it enhances their robustness quite considerably, described as heavy duty. Thanks for your kind words on the written article. Quality constructed resin sheds represent a gateway to eliminate time consuming maintenance roles with regards to varnish, paint and roofing felt replacements. Polyethylene is long lasting, impermeable and resists decay therefore requires no future conserving meanwhile restoring their looks is simply accomplished by an expeditious wash to which we occasionally deliver by connecting the shower adaptor onto the hosepipe and spraying the facade. Would flowers survive a Winter in these Lifetime Sheds? Flowers? Yes, a lot of people use sheds to store plants and I do know a lot of people store bulbs in them over winter to stop them freezing. 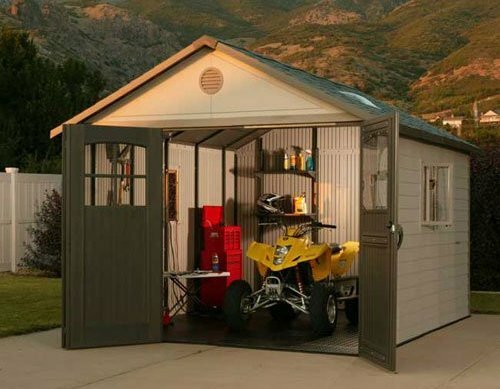 A lot of people store things like that in their garage too yet a shed does a very similar job plus you have windows for light and this is a better advantage for plants through the winter. She loves gardening. I wish I can find something like that for her here in Serbia. Although I believe that my dad would like one too. Yeah, these are wonderful sheds. Very popular in the USA. There’s a whole variety of different sizes to suit all tastes. Just depends how much storage you need and how much room you have to sit one in your garden. Some of them remind you of small houses the way they look. I do like the Lifetime 11 x 13.5 ft one, top quality model here and will fit a whole host of storage. I don’t know whether they market them in Serbia. I’m in the UK, Keter are more popular models here, but Lifetime are the most popular in America.